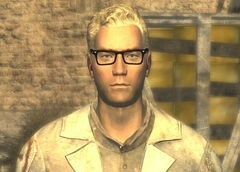 Arcade Gannon is an NPC in Fallout: New Vegas, who is first found in the Old Mormon Fort in the town of Freeside. He can be recruited to accompany the player-character on their game quests. He is revealed in some game trajectories to be gay. For example, if a male player character with the Confirmed Bachelor perk tries to recruit him, the PC can flirt with Arcade, to which he will respond: “Overt flirtation will get you everywhere, you know.” You can watch a video of this scene here (starting around 3:50). These are the only dialogue options in 459 total for Arcade that reference his sexuality. There is a trail of events in the game that can lead to the player-character selling Arcade to Caesar, whom Arcade hates and whom has outlawed homosexuality (punishable by death) in Caesar’s Legion. Oddly enough, though, despite his openness about his own sexuality, Arcade never once mentions this as a reason for why Caesar taking over would be bad (though he has many, many lines about Caesar in the game). A video overview of Arcade’s role as a companion character is available here. This entry was posted in 2010s, Characters, Gay, Gay (explicit), Queer Men on December 1, 2015 by Adrienne Shaw.